Who better to tell you where to get the best hot dog in New York City, or to find the best cup of coffee in Philadelphia, than chefs whose very livelihoods depend on their tastebuds? 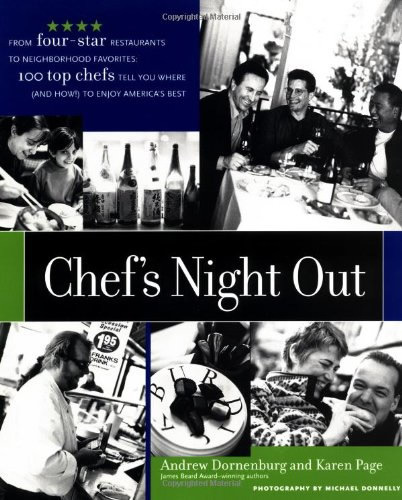 CHEF’S NIGHT OUT is a cross-country journey through 28 major cities chronicling the most beloved eateries of 100 of America’s leading chefs, from Rocco DiSpirito’s beloved spot for pastrami sandwiches in New York City to Charlie Trotter’s favorite Italian beef in Chicago. You’ll learn why top chefs rush to eat at Bizou in San Francisco and Uglesich’s in New Orleans (and what you shouldn’t miss a taste of when you’re there!). The book is also a guide to top chefs’ own restaurants, as they share tips on what to order and how best to enjoy the experience. Leading professional chefs across America agree that the most important aspect of a professional chef’s development is eating out. What most of the general public does for sustenance, and many restaurant lovers do for entertainment, is the lifeblood of an ambitious chef’s professional development.